The Aquino administration cannot hide the incompetence of DOTC Sec. 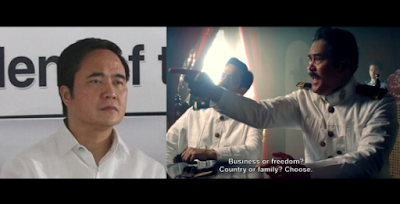 Joseph Emilio Abaya by conveniently referring to the original sins of the Ramos administration, the partylist group Partido Manggagawa (PM) said in a statement. The group said that while it completely agrees with the ‘original sin’ line of the Liberal Party (LP) in identifying the main problem besetting the MRT system, the administration is likewise guilty of repeating the same mistake by lining all the rehabilitation, maintenance, and expansion programs for MRT/LRT systems under PPP (Public-Private Partnership), which is but another name for the Ramos-era BOT (Build-Operate Transfer) scheme. “LP should not point an accusing finger to other sinners when what it can only offer to our people is the same menu placed in separate tables,” said PM spokesman Wilson Fortaleza. Fortaleza said LP stalwart Edgar Erice was right in describing the MRT-3 contract as ‘highway robbery’ yet he avoided to explain why the ‘tuwid na daan’ failed to apprehend the robbers. “Erice is also correct in considering the option of expropriation to finally eliminate the resistance of the MRTC consortium, yet his DOTC secretary wasted six years on cherry-picking who among his choice concessionaires would replace the Sobrepenas and the former supply and maintenance provider,” said Fortaleza. Fortaleza added that for the last six years, the Aquino administration pursued not the track of expropriation but of privatization, first by gradually removing the subsidy through fare increase, and second, by lining all MRT/LRT maintenance and expansion projects to PPP concessions. “This PPP scheme, which is no different from BOT, caused the delay of the much needed rehabilitation of the MRT system, the expansion of LRT 1 to Cavite and the construction of MRT 7 from North QC to Fairview and Bulacan. Abaya even failed to connect LRT 1 and MRT 3 simply because the Ayala and Henry Sy fight over the common station,” lamented Fortaleza. As to Abaya who faces other pressing problems in the transport and communications industry, the labor group said that with no action coming from PNoy, they can leave his fate to Heneral Luna since the problem with our current mass transport system is larger than the secretary’s head. PM partylist is calling for quality public services in its electoral platform, and its components include the development of safe, clean and affordable mass transport system. And to be able to do it, the program needs huge amount of public investment and subsidy, not the abdication of state responsibility.